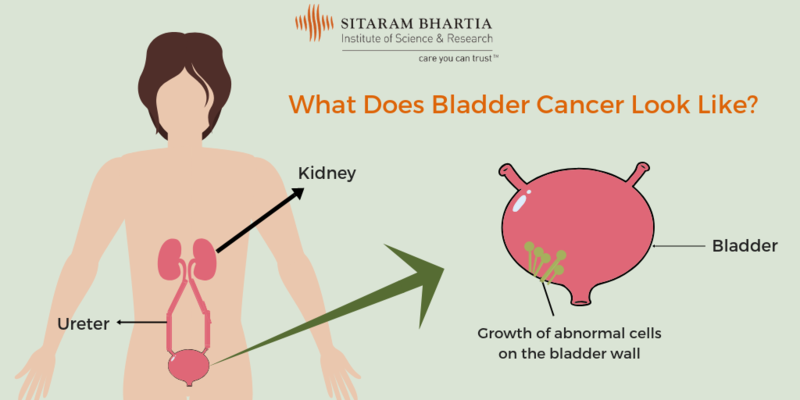 Bladder cancer is one of the most common forms of cancer affecting 1 in every 4 men above the age of 40 years in India. Its most recognizable symptom is blood in urine. Jatin Deshmukh (48) was faintly aware of this condition since his uncle once had it. When he noticed the pinkish, red colour of his urine, he immediately scheduled a consultation with a urologist. He decided to consult Dr. Rajesh Khanna, Senior Consultant, Urology at Sitaram Bhartia Hospital in Delhi who had treated his uncle for the same condition. “Urine, which is red in colour, is a condition called haematuria or visible blood in urine,“ explained Dr Khanna. Upon further questioning, it was found that Jatin was a frequent smoker. With a hunch about the cause behind the blood in urine, Dr Khanna advised some tests. Bladder Cancer – How is it diagnosed? To begin with, a urine examination was conducted to detect the amount of blood in Jatin’s urine and to rule out the possibility of a kidney stone or ureteric stone. 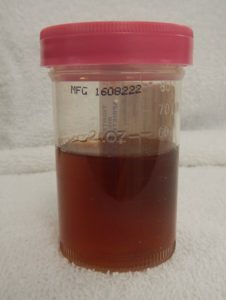 A urine culture was done which came out to be totally clean excluding infection as a possible cause of the haematuria. Urine cytology revealed the presence of abnormal cells which raised the suspicion of bladder cancer. A cystoscopy was then planned to get a proper diagnosis. The cystoscopy helped detect a two cm tumour on the wall of the urinary bladder, which, it seemed, was the cause behind the haematuria. Jatin got extremely scared upon hearing the word ‘cancer’ so Dr. Khanna consoled him by explaining the different grades and stages of bladder cancer that indicate the extent to which cancer has spread. A CT Scan was carried out to identify the stage of Jatin’s cancer. Much to Jatin’s relief, the scan revealed a superficial bladder cancer. How is Bladder Cancer caused? “Does bladder cancer run within families?” asked Jatin remembering his uncle’s diagnosis of bladder cancer. “People with a family history of bladder cancer are more at risk of having it,” said Dr Khanna. Bladder Cancer – Which treatment is best suited for you? Once Jatin felt a bit calmer, he went over the treatment options with Dr. Khanna. During this discussion he learned that there are different treatment options available for bladder cancer depending on its level and grade. “For a low-grade superficial bladder cancer, a Transurethral Resection of Bladder Tumour (TURBT) is the treatment of choice. This procedure is similar to cystoscopy except in this a special cutting instrument is also inserted through the urethra which is used to remove the growth from the bladder lining without damaging the deeper layers of the bladder.” A deep muscle biopsy is also done during the procedure to confirm whether the cancer is invasive. “Which treatment method is suitable for a high grade bladder tumour?” Jatin asked out of curiosity. “People presenting late will often have tumors which have spread deep within the bladder wall (also known as invasive tumour) requiring complete removal of the bladder with reconstruction of a new bladder out of intestine to create another exit for urine” explained Dr. Khanna. Chemotherapy is also advised to patients whose tumours are invasive. The doctor suggested Jatin to go for TURBT as his cancer was limited to just the surface of the bladder wall. Jatin discussed the procedure in depth with his family members and finally decided to go ahead with it. He got admitted for the procedure which was performed by giving him spinal anesthesia. He was able to go home the day after the procedure and the urinary catheter was removed after three days. 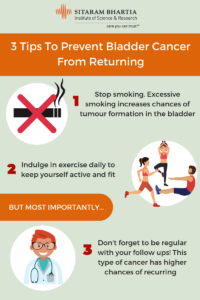 How do you prevent bladder cancer from recurring? In a follow-up consultation, Dr. Khanna explained to Jatin that bladder cancer often has higher chances of returning in future. So, it was essential for Jatin to take extra care and follow some basic steps to prevent recurrence. He also advised Jatin to exercise regularly and include more of fruits, vegetables and whole grains in his diet. It was hard to give up smoking, but the thought of the cancer recurring gave Jatin the courage to do what needed to be done. “To be honest, I was extremely scared when I was diagnosed with bladder cancer. But the support I received from my urologist and the staff really gave me the psychological strength to go ahead with the treatment. I am so glad I trusted my instincts and came in for that consultation early on,” concluded Jatin.